More evidence has emerged of what is described as a “dynamic” landscape of prehistoric settlements in the North East. 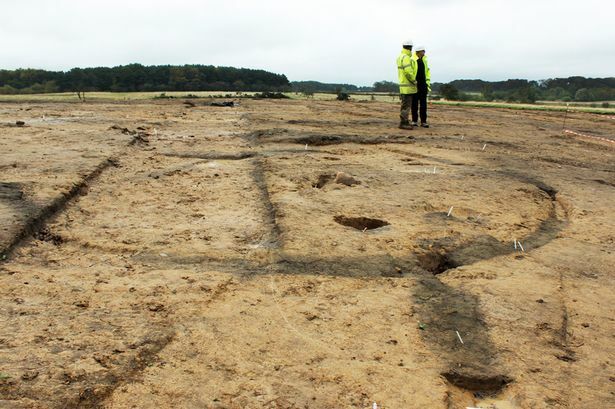 Excavations carried out by Headland Archaeology at the Brenkley Lane surface mining site to the north of Newcastle have revealed an Iron Age settlement across a five-hectare area which is centred on four roundhouses within a double rectangular enclosure. The Iron Age dated from around 800BC to the Roman conquest. The two month-long dig, on behalf of operators Banks Mining, has revealed a complex series of archaeological features spread across the site, with the remains being grouped into three main phases of activity. Most of the remains uncovered relate to an extensive period of occupation during the Iron Age, with a series of large rectangular ditches enclosing several concentrations of ring gullies, which are the foundation trenches of the settlement’s buildings. Pits and other features, such as boundary and enclosure ditches, have also been uncovered, suggesting that buildings had been rebuilt several times. Objects uncovered include Iron Age quern stones for processing grain, a spindle whorl for weaving, ceramic vessels used in salt transportation and Bronze Age pottery, suggest that a mixture of domestic and food-processing activities were carried out in the area, with features nearby thought to relate to the management of livestock. An early Bronze Age cemetery, dating from between 2,100BC and 750BC, is represented by three cremations, while a period of medieval activity between 500 and 1,500 years ago is shown by a grain-drying kiln and extensive rig-and-furrow agriculture. In 2008, one of the most complete Iron Age settlements to be excavated in the North East, which comprised approximately 50 roundhouses in an enclosed two-hectare area, was unearthed at Banks’s now-restored Delhi surface mine on the Blagdon Estate near Seaton Burn. “It’s fascinating to see how this area was worked and inhabited through the ages. “We’ve worked closely with archaeologists across many of our sites for several years to ensure that detailed investigations are carried out and proper records kept. “These discoveries simply wouldn’t be coming to light without the surface mining work . Previous discoveries as the Dellhi and Shotton surface mining sites have included a regular system of prehistoric landscape division. Pit alignments ran perpendicular to the south bank of the River Blyth, which archaeologist Jon McKelvey suggests may have marked off areas such as pasture, woodland and access to water for communities. Three large Iron Age settlements have also been revealed at Blagdon Park and East and West Brunton, with substantial banks and ditches designed to illustrate the wealth and power of the occupants. It is now thought that in the late Iron Age the coastal plain, for at least 25km north of Newcastle, was covered with settlements at 1km intervals. An Anglo-Saxon settlement was also found at Shotton consisting of six halls. Is it a dog, a badger or an old fox? Well, experts think this may be the first sighting of a Raccoon roaming free on Tyneside. The furry mammal, usually found in North America, was spotted by a surprised jogger in Wallsend on Friday morning. Wildlife experts believe it is the first recorded sighting of the wild beast in the area. Tom Hughes, 22, was running through the grounds of Wallsend Hall at around 7am when something caught his eye. He said: “I was running along and came across this curious creature. “At first I thought it was a badger but its unusual facial markings made me think it was a raccoon. Tom, who lives in Howdon, near Wallsend, is training to be in the Navy. He said he hasn’t seen anything like this before but hoped to raise some awareness of the creature being out there. “I wasn’t going to go for my run on Friday morning but I’m glad I did now,” he said. The last recorded sighting of a raccoon was in Sunderland in 2012. They are considered dangerous with changeable temperaments, but some people are known to keep them as pets. Following a change to the law in 2007 which removed the need for a licence, they are becoming more prominent in Britain. Several sightings have also been recorded in County Durham. 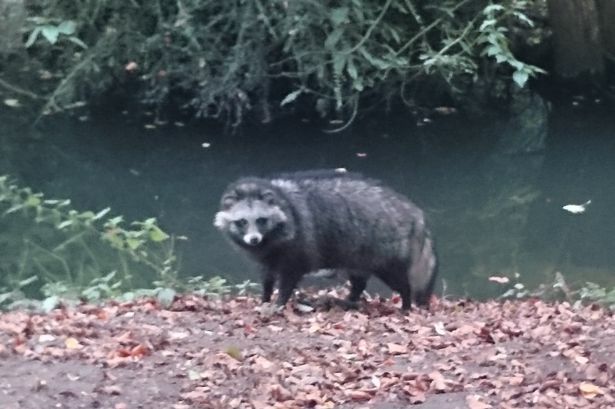 Steve Lowe, head of conservation at the Northumberland Wildlife Trust based in Gosforth, Newcastle, said: “That is either a raccoon or a raccoon dog. “Because we can’t see the feet we can’t be certain which. “These are non-native animals which appear to be kept as pets. They can be aggressive so inevitably in such circumstances the owner finds them too hard to handle and abandons them. “The last record of one was in Sunderland in 2012. In a city whose story goes back to the Roman occupation there will be many little-known nooks and crannies left behind by history. From the vampire rabbit opposite St Nicholas Cathedral in Newcastle to the “plaguey burial ground” at Byker, there would seem to be no spot left undiscovered. But Alastair Bonnett, professor of social geography at Newcastle University, has laid claim to one. He came across the city’s “lost island” on his journey to work from his home in Heaton. The discovery led him to clamber over the barriers on the Central Motorway East – at a quiet time, it has to be said – to investigate. His destination was a wooded, triangular piece of land left marooned by the building of the motorway and its slip roads in 1975. Since then, the island has remained unregarded and unnoticed by the thousands who drive past it each day. “These places are easily ignored, but once you start noticing any particular one it can start to exert a queasy fascination,” says Prof Bonnett. “It’s as if you are seeing a landscape that is invisible to everyone else. Having reached his island, Prof Bonnett found a mix of maple and alder trees and self-seeded shrubbery. His excursion was part of his interest in an age when Google Earth would suggest that every discovery has been made and every adventure had. Not so, says Prof Bonnett, who provides the evidence in his new book Off the Map, from Aurum Press at £16.99. In the book he explores 47 places across the world – and the island on his doorstep – which qualify as being off the map. It will all be included in his talk on maps and the imagination at the Edinburgh International Book Fair on August 19. Part of Prof Bonnett’s argument is that places matter to people – where they come from and where they live. We are, he says, a place-making, place-loving species. What makes your place special – its diversity and character – is important. But paradoxically, says Prof Bonnett, was as well as the attraction to place there is also the human need to explore, to discover the new. That manifests itself from the great voyages of discovery over the centuries to the carrot of exotic destinations dangled by the travel industry. Our fascination with the hidden, the lost, the secret and mystery is evidenced by the obligatory use of the words in the titles of a certain type of TV programme. “We can develop intense relationships with places,” says Prof Bonnett. One of the main components of character and specialness is evidence of heritage and history. “When you get rid of the past, it’s like a form of ideological cleansing, where only one vision survives,” says Prof Bonnett. He is originally from Essex and moved to Newcastle in 1993. He says: “ I saw that in Newcastle a very distinctive identity and culture had survived, and it was one of the inspirations for the book. The North East has been through the same process as everywhere else, but nevertheless it has retained something special. The island of New Moore, which emerged in the Bay of Bengal as a cyclone washed material down rivers into the sea. It was claimed by both India and Bangladesh. India stationed troops on it in 1981 and erected a flag pole. But before the arguments could start the island sank beneath the waves. Zheleznogorsk, 2,200 miles east of Moscow, was established in 1950 to make nuclear weapons. It did not appear on maps and was referred to by a PO box number. It was only in 1992 that its existence was officially confirmed and entry is still highly restricted. Derinkuyu, Turkey. A chamber was revealed when a wall gave way. It led to the discovery of underground rooms large enough to house 30,000 people, wine and oil presses, stables, food halls, a church and staircases, all built it is believed by early Christians living in what was a lawless area. North cemetery in Manila and the City of the Dead in Cairo. Both are home to thousands who have moved in among the tombs. North Sentinel Island, 800 miles to the east of India, which has no natural harbour and is surrounded by reefs and rough seas. The five-mile wide island is home to a tribe of around 100 who fire arrows at anyone who attempts to come close. Wittenoom in Western Australia, whose only industry was a blue asbestos mine. The town of 20,000 officially ceased to exist in 2007 because of the levels of contamination. Kjong-dong in North Korea – a fake place where lights go on and off in tower bocks with no glass in the windows. There are no residents or visitors. The blocks were built to suggest North Korea’s progress and modernity and to lure defectors from South Korea.